Introduction to VARIABLE VALUE STAMPS or ATMs. 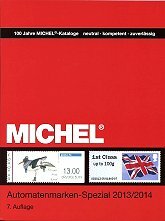 Most of the world wide philatelic catalogues include ATM issues along with some basic information, usually in separate sections, as in the case of the French YVERT & TELLIER (Timbres de distributeurs) catalogue or the German MICHEL (Automatenmarken). National catalogues often include such issues under each issuing country. The German catalogue, Michel Automatenmarken-Spezial 2013/2014, specializes in world wide ATM issues and, at the present time is the leading reference book used by collectors of the subject. The last edition, in full colour and totally updated, includes ATM issues up to October 2013. 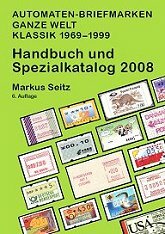 Markus Seitz, the author of the earlier editions of the Michel catalogue, between 1994 and 2004, and probably the world's leading ATM specialist, has edited the catalogue Automaten-Briefmarken Ganze Welt - Klassik 1969-1999. This is a highly recommended specialized catalogue which includes worldwide ATM issues between 1969 and 1999, the period which the author considers as being the 'classic' era for this type of collecting. With a lot of information - it makes essential reading. 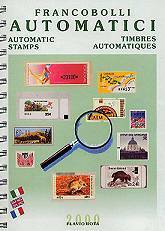 In 2000, the Italian publisher, Flavio Rota, published the second edition of its specialized world wide catalogue of ATM issues, FRANCOBOLLI AUTOMATICI 2000 / World Automatic Stamps Catalogue. 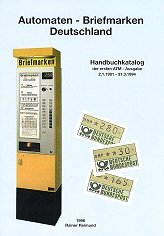 The catalogue shows all the world wide ATM issues from 1969 up to May 2000, along with interesting studies about the ATM distributors, varieties and other items related to this subject. A splendid work for all collectors who want to be introduced to the exciting world of ATMs. Automaten - Briefmarken Deutschland is a catalogue edited by the German, Rainer Reimund. This, however, is not a worldwide catalogue, but an interesting study about German ATM issues, between 1981 and 1994.